I went to Northern Ireland to visit my cousin and his lady. Kev has lived in NI for about 10 years on and off, the off bits being spent in even more glamorous locations such as Kosovo, Afghanistan and Iraq. He is having a lovely house built with his lady O. We got picked up from the airport on Friday lunchtime and got whisked away to O’s house to the west of Belfast. Kev told us all about how things had changed dramatically since he first lived there and much of it happening in the last 2 years or so. O’s house is lovely but she has sold it to her cousin who’s dad has done a deal with her over the land their house is being built on, (it’s all very complicated). We lounged around for a bit then nipped of into the village, (Moira) to get some lunch and have a few glasses of vino, (now this is the trend of the whole weekend). We chatted about ‘the family’ but that’s a very long complicated story. Kev then spent a small fortune at the off license and bought some meat for a BBQ then off to view the building work. Oh my god the house they are having built is huge. 4 bedrooms and the biggest kitchen in the world. Solar water heating, ridiculous insulation and reclaimed beams being used, yay well done you do listen to me sometimes. It’s beautiful and nestles into its surroundings perfectly. The house should have been finished for our visit but the windows were 6 weeks late so unfortunately it isn’t. Which means we will have to go back over for a house warming party, oh what a shame. Back to the cottage where we got introduced to the cats, 2 strays called Slick and Marmalade who are the luckiest cats in the world. Their stray mother got run over days after giving birth. O and Kev knew there were kittens somewhere but couldn’t find them. 5 days after she was run over two very small balls of fluff managed to make it to the door step of the house. Kev and O fed them on milk and crushed up biscuits and they are now almost fully grown. There is also Cleo the cat who is the old timer and has serious arthritis so gets fed cod liver oil. Arhh bless. We then mostly lounged around watching TV and drinking tea, this soon moved onto wine and then it was time for more food. And that was Friday night. I got a wee bit drunk but not too bad and talked about death and my ED. Must stop doing that. Next day Kev got up early to go to work for a few hours, O cooked us brekkie and we read the papers. 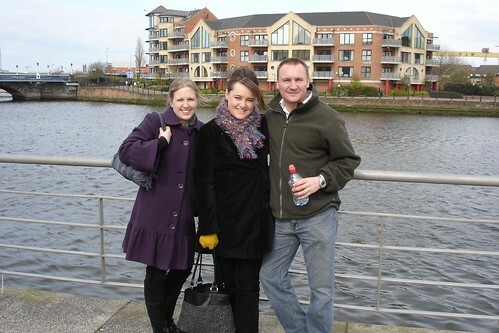 Then when Kev got back we went into Belfast on the train. What a stunning little city. First stop was the Crown just opposite the Europa Hotel it is just beautiful inside. The tables for eating are all inside little wooden cubicles like old-fashioned railway carriages. The windows are all stained glass and the ceiling a really deep red. I had Guinness for the first time ever. I thought i would hate it as I usually despise anything made with hops but I gulped it down and will definitely have it again, especially when anaemia strikes. Anyway the Europa hotel, (ring any bells?) It did with me and looked really familiar. It turns out it is the second most bombed hotel in the world, (some place in Sarajevo wins that little competition). Then off to another pub which I can’t remember the name of for some food. 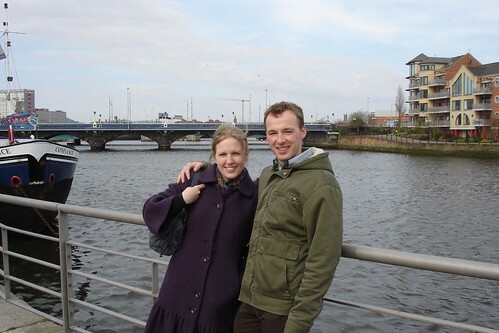 We then wandered around Belfast towards the River Lagan, (sometimes I can hear the water calling to me it says oy BINT I’m over here come and have a butches). Kev was shocked that some of the streets were actually open to walk down to the River as this had only just happened. It’s like being on the edge of something great, this little city waking up after 40 years of sleeping and suddenly thinks I know what I’ll do, I’ll be a city again not a bomb crater. This was especially apparent later on but I’ll get to that. After a bit more of a wander we went to Cafe Vaudeville which is a huge old bank. Vaudeville apparently is a style of theatre that was popular in N. America that used to encompass loads of diverse stuff from acrobats to mathematicians, (ooh that must have been exciting to watch!!). The building has a really high ceiling with a cast iron spiral staircase leading up to a VIP area on a sort of gallery over looking us mere mortals. The place has been decorated as decadently as you could possible imagine with Art Nouveau being the main style. Anyway, the place has a massive cocktail menu so we had a couple. It had full on cocktail makers which I have never really witnessed before. I had a Mojita, (my favourite). Then we went to the Merchant Hotel Bar. Now the Merchant used to be the Headquarters of the Bank of Ulster and is a very grand old building. It is now a 5 star hotel but in a VERY unpretentious way. Everybody was treated like a queen here, (or a king). There were no tables left so we sat at the bar, we got bought nibbles and a jug of water and a cocktail menu by the immaculately dressed waiter. I ordered something pink and classic, I can’t remember what, (remember I had already had 2 cocktails). Now I was in awe of the last cocktail waiters but this place, oh my goodness. We were lucky to be sat at the bar because we got to watch these artists at work. There were two of them and both had different shaking techniques, one was up really high shaking the shaker way above his head, the other one was crouching down a bit shaking down by his stomach, when they both did this at the same time it looked like some sort of ancient dance. They tasted the cocktails before sending them out then the little headwaiter did the same and in more than one case the cocktail waiter said he wasn’t happy and tipped it away and started again. You certainly don’t get that in the Conservatory, (crappy cocktail bar in Worcester). I don’t think I can ever have cocktails anywhere else ever again after this place, they will just pale in to insignificance. As I mentioned earlier Belfast feels very new and there seems to be a great deal of anticipation. The going out in the centre of town in the evening thing is still very new. People used to stay where they knew each other and so you would only go to your local. Which is understandable especially when O told us about her Aunt who worked in the centre of Belfast in the 70’s and was in more than one bomb blast. Anyway, time for din dins, just at a nice grill place. They had lost our booking but still managed to squeeze us in and gave us a nice window seat. We were all quite merry and a bit tired by now so after we had eaten O went and booked us our taxi and Kev went and stealthy paid the bill like he always manages to do and we went home. Then we had some more booze and I fell asleep on the sofa. Sunday morning we had a nice breakkie and then got driven around the less desirable parts of Belfast. I wanted to see the murals and so we got driven down the Falls Road first. The murals are stunning and obviously a lot has changed in the area, there is now an open topped bus tour of Belfast that takes in the murals in the Loyalist and Unionist areas. Kev didn’t fancy this though and so drove us quite fast down the Falls road whilst pointing out the various famous murals. The most famous ones being of the 10 people who died whilst on hunger strike. I do wonder if the murals will now stay as they are tourist attrations or whether they really should get rid of them as it keeping the hatred alive. Ah well not for me to decide. Just one little story of the troubles, which I think, illustrates the chaos and the violence caused by the constant retaliation. We saw the famous Milltown cemetery, which is where Michael Stone opened fire on the funeral of 3 IRA members who had been shot in Gibraltar by the Army. To try and stop any confrontation the Ulster Police and British Army had agreed to stay away from the funeral. Stone opened fire and chucked grenades just as the coffins were being lowered into the ground. He killed 3 IRA members and injured 60 more. His reasoning was that the IRA had bombed a Remembrance Day parade in Eniskillen killing 11 people. He ran off but was caught by the chasing crowd and bundled into a car. He was being driven off to be shot when the Ulster Police intercepted the car and took him to hospital then prison where he received 684 years, (he had also admitted shooting some other people before this paticular massacre). Anyway, during the funeral of the 3 that he had shot, two corporals in the British Army accidentally, (supposedly) drove into the middle of the funeral procession. TV cameras showed the men being dragged from their vehicle and taken away where they were shot. Michael Stone was released under the Good Friday Agreement in 1998 after serving 13 years of his sentence. In his autobiography he claims to regret what he did etc… but he still got arrested again for breaking into Stormont in 2006 whilst a debate was going on the devolution. We then went down the Crumlin Road, past the Crumlin Road Gaol, which used to contain loads of IRA members and a couple of Loyalist terrorists too, (were they trying to cause trouble!!) but is now derelict. Then onto the Shankhill road to look at the Loyalist murals. I actually found these more alien. Such patriotism, loads of stuff about the Queen and a huge mural commemorating the Queen mother. Kev then took us to see the ‘peace wall’ oh my god, it’s freaking huge. It still gets locked at night but is generally open during the daytime now. There is just waste ground surrounding it. 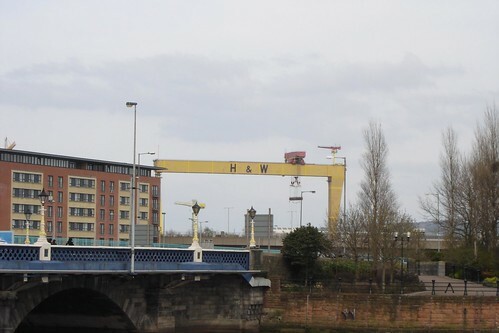 Anyway, we had a quick drive up to Stormont, then around to the dock where the Titanic was made and the vast Cranes Sampson and Golliath were tootling about. before stopping for some lunch then driving back to the house where we lounged around for a bit and Kev gave us a picture with all the murals on. Ahh bless. We then packed up and Kev took us to the camp where he is based and told us some nasty stories before dropping us off at the airport. All in all a lovely trip.